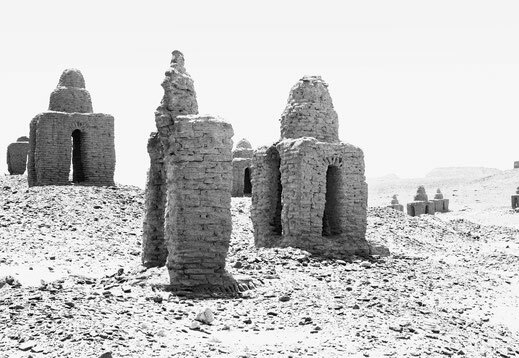 "These mud-brick domed tombs as the most conspicuous features on the plain behind Gebel Adda, some fifty or so of them where scattered over the Cemeteries 1 and 3. Those in Cemetery 1 in almost all cases were built on X-Group tumuli, and it was thus necessary to record, photograph and demolish several of them in the course of the work, in order to excavate the older tombs beneath. The contents of the large vaulted chambers which formed the substructure of these tombs yielded no more information about the date of their construction". ( Nicholas B. Millet in Gebel Adda Preliminary Report for 1963 ). 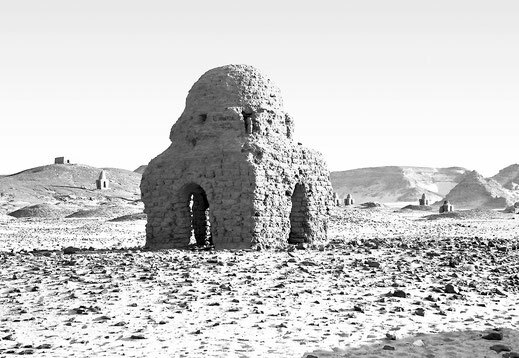 Among the mud-brick domed tombs in Cemetery 1 and 3 were several graves without a superstructure and only a few of them were covered with a single layer of plastered mud-bricks. In Cemetery 1 and 3 a few tombs of this shape were observed. Above a rectangular platform made of only one mud-brick course, exact dimension not known, a solid block of mud-bricks was built. 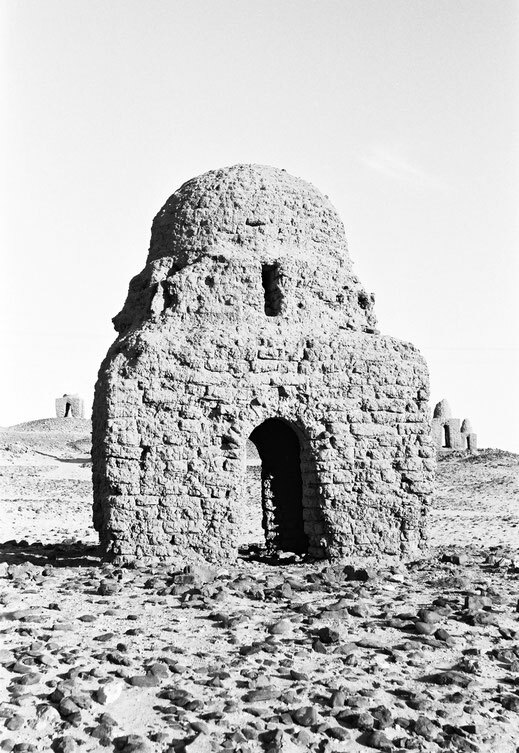 For the construction of this Rectangular tomb type and the Domed Ottoman tombs mud-bricks of a larger size were used. At the southern end all this superstructures were better preserved and still had a hight of 1.50 meters, while the northern part in all cases was badly eroded. 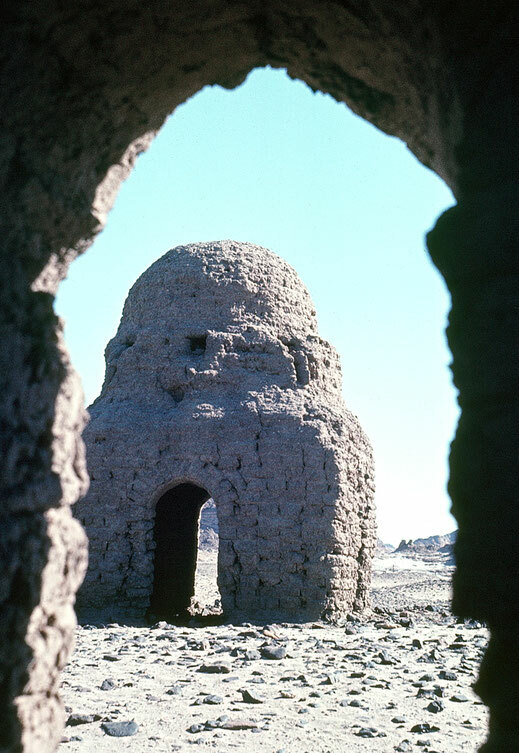 Since all the superstructures of this tomb type were eroded at the same side it seems plausible, that the mud-bricks were not removed for any other purpose, but were worn off by desert storms. 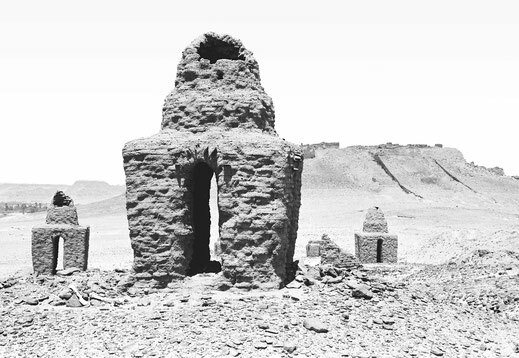 I can not say if any tomb of this kind was ever investigated and only judging from the photographs it is not clear, where the northern part of the superstructure ended. Also I do not know, if any of these tombs had vaulted burial chambers bellow the platform. 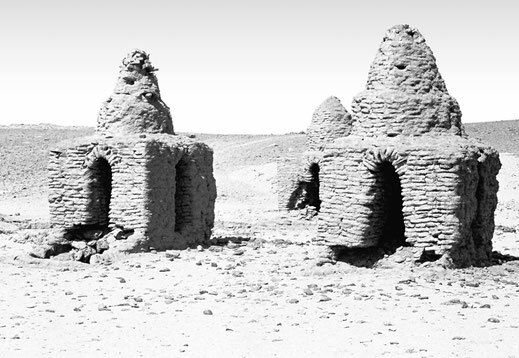 The severe erosion of the mud-bricks not noted in any other structures might indicate, that this tombs were of an earlier Islamic period. 2. 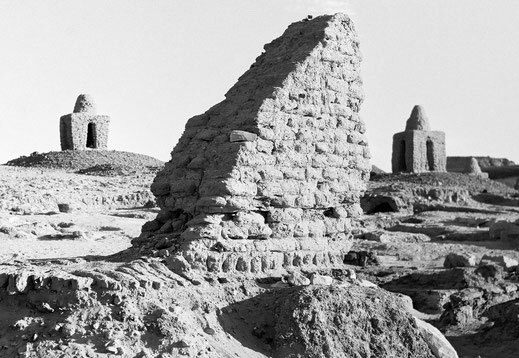 Rectangular mud-brick superstructure in Cemetery 1. Behind with Double domed tombs above X-Group tumuli. 1. 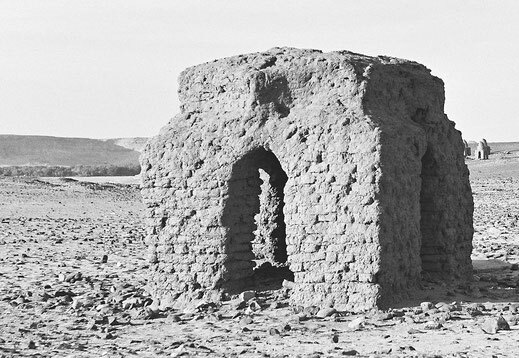 Rectangular mud-brick superstructure in Cemetery 1. Behind with Double domed tombs. On the hilltop the rectangular walls of a more recent tomb. 3. 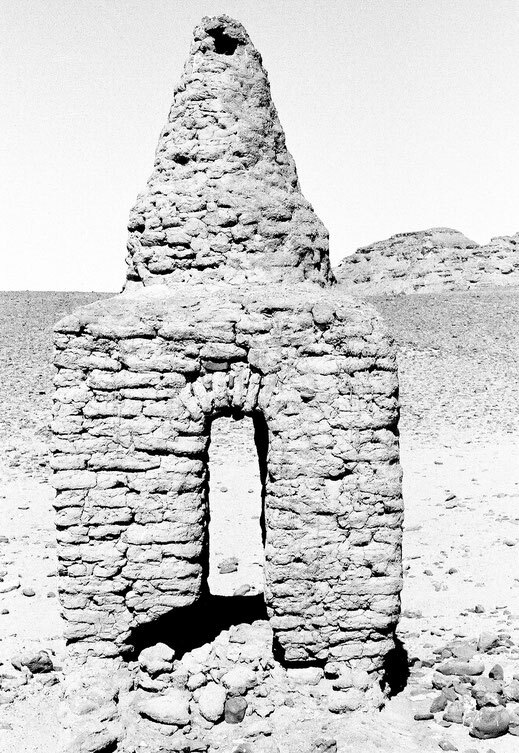 Rectangular mud-brick superstructure in Cemetery 1. Behind with Double domed tombs above X-Group tumuli. 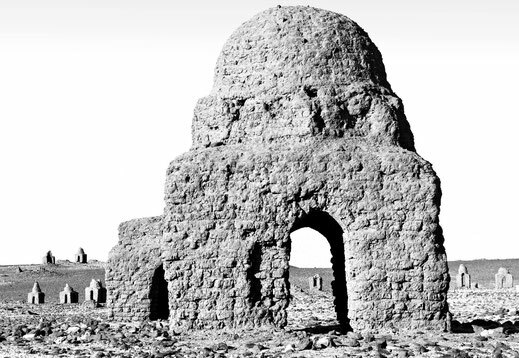 Only five of these large Domed tombs were found in the plain. 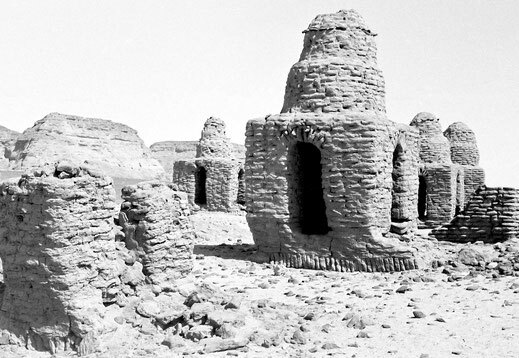 To support the massive structure, mud-bricks of a larger size and thicker walls were used. On all sides an arched opening led to the inside of the superstructure. The domes, resting on a round and recessed ledge, had on all sides narrow openings. 1. Photograph taken from the Citadel hill looking southeast, shows a group of three Domed tombs of which the domes of two superstructures were missing. The tomb at the right side of this group had been later excavated. Of the results I have no further information. Behind: tumuli field of Cemetery 1. 3. Different view of tomb Nr. 2. 5. Different view of tomb Nr. 2. Behind tumuli field of Cemetery 1 and the remains of an Rectangular mud-brick superstructure. ( photo by Horst Jaritz ). 7. Cemetery 1. Location north with Domed tomb in the foreground. Behind was another tomb of the same type of which the dome was missing. 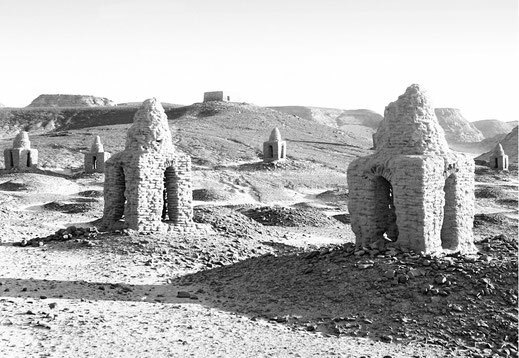 Background: Double domed tombs and tumuli. 2. 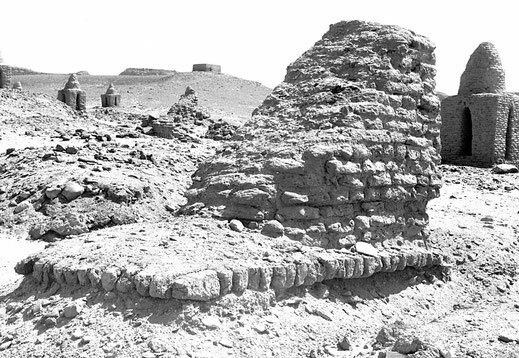 Enlargement of left photograph with the Domed tomb Nr.2 intact. Here it shows the arrangement of the 8 narrow openings in the recessed ledge. They were placed above each arched openings and the four corners of the superstructure. Behind is the tumuli field of Cemetery 1. 4. Another view of tomb Nr. 2. 6. Different view of Tomb Nr. 2. 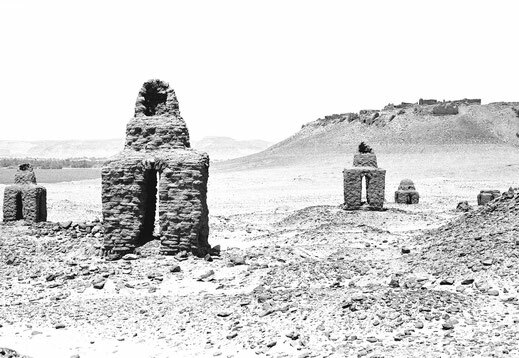 To the right the eastern ridge of Gebel el Shams. 8. Cemetery 1. Location north with Domed tomb type behind Nr. 7. The dome of this superstructure was missing. See also photograph Nr. 1, where of the three Domed tomb types two where without a dome. 1. Cemetery 1. 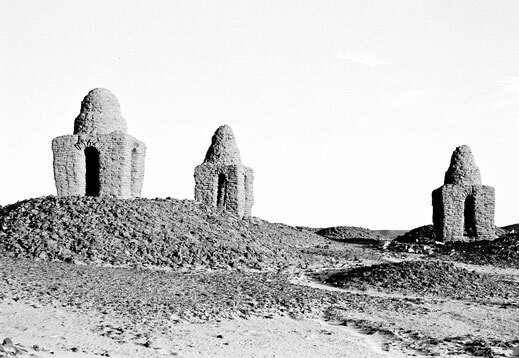 Foreground with Double domed tombs on top of X-Group tumuli. 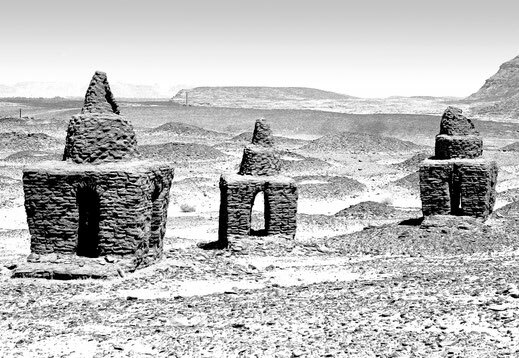 For the construction of these tombs mud-bricks of a smaller size, ca. 32 cm x 15 cm x 8 cm, where used. Behind the southeastern part of the Citadel and the River Nile. 2. Cemetery 1. 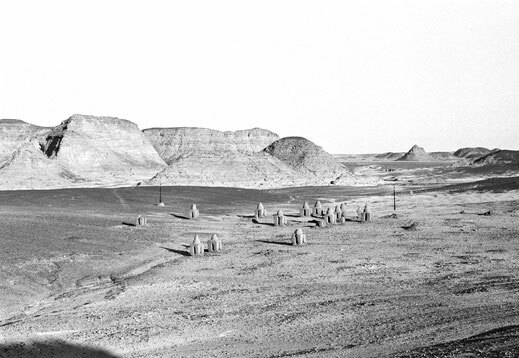 Foreground with Double domed tombs built on top of X-Group tumuli. Behind the northeastern part of the Citadel with the remains of the Meroitic stone wall and the two trial trenches. 3. Foreground with a part of the large tumuli field of Cemetery 1. 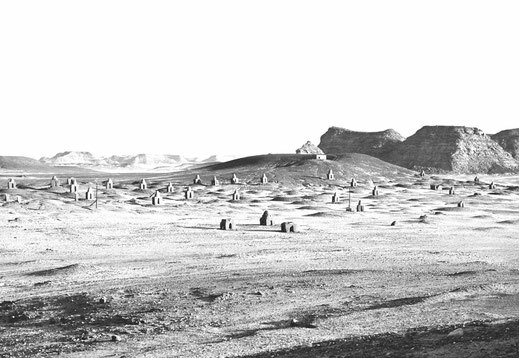 The tumuli of various sizes were covered with black ironstones and all had in the center the typical plunder hole, covered with wind blown yellow sand and gave the impression of a surreal landscape. A few of the tumuli and the Double domed tombs closer to the Citadel hill belonged to Cemetery 3. The background of the photograph shows the eastern slope of the Citadel hill with the remains of the townsite and the large stone wall of Meroitic temple at its northern end. 4. Cemetery hill. Southern end of Cemetery 1 with large tumulus and Double domed tomb. ( photo by Horst Jaritz ). 6. Cemetery hill. Tumuli field and Double domed tombs. Background with later tomb. 8. Tumuli field direction southeast. 10. Double domed tomb direction northeast. 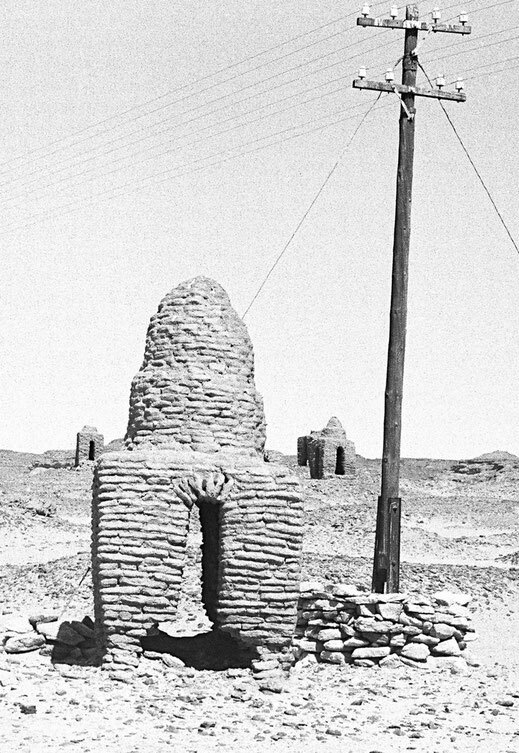 Telephone wire connecting Aswan with Wadi Halfa. 12. 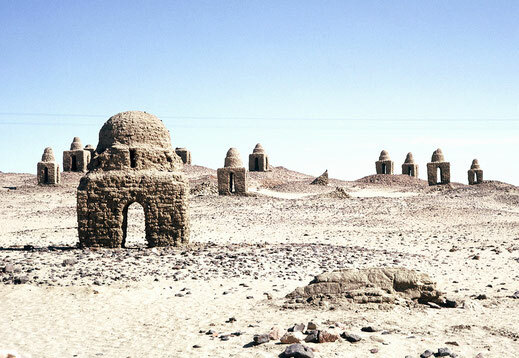 Group of Double domed tombs direction north. 14. 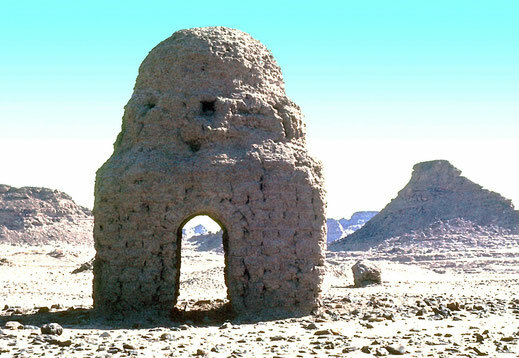 Double domed tombs direction north. Here it shows two superstructures with more pointed domes. 5. Cemetery hill further north. 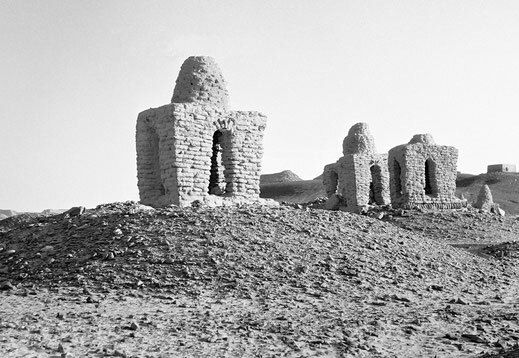 A group of Double domed tombs built above tumuli. At the right side the outside walls of a later tomb. 7. Cemetery hill further north with group of tumuli and Double domed tombs. 9. Tumuli field direction southeast. In the foreground with three Domed tomb types. 11. Pointed Double domed tomb direction northeast. 13. 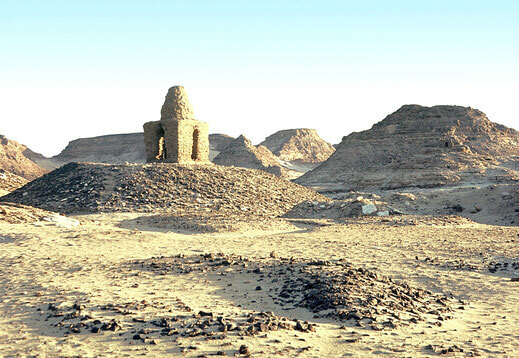 Group of Double domed tombs direction north. Left: Superstructure more pointed. 15. 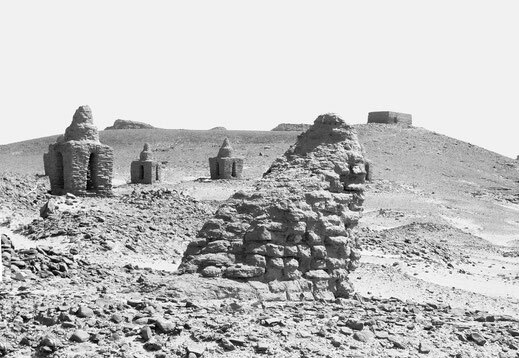 This is the only photograph I have of Cemetery 5, showing a group of Double domed tombs.